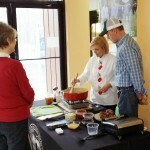 Chef Carol with Don Duncan from Grayson Natural Farms. It’s no secret I am a huge fan of grass fed beef; healthy omega 3 rich meat raised on organic grass without hormones and antibiotics administered. Truth is, much as this sounds like a healthy option, I have tried many different sources of grass fed beef so often been disappointed; tough, bland steaks and stewing beef that takes hours to cook to tender. What’s the beef with that? True grass fed beef means the animals where raised on organic pastures, and chomping on all that healthy grass, while roaming around they don’t really get much chance to fatten up. Feedlot raised beef fed a smorgasbord of corn, soy and even left over candy will typically weigh about 400 Lbs more than a grass fed animal at time of slaughter, which accounts for the marbling in the meat and flavor. Many grass fed farms ‘grain finish’ the beef, allowing the animal to fatten up to produce a better tasting steak, not true ‘grass fed’ in my book. While attending the Fresh Expo in Charlotte last fall, I met the team from Grayson Natural Farms, and tasted some of their delicious beef. The marketing manager Don Duncan shipped me a couple of their steaks and short ribs to try out; now a ‘slow cooked’ cut of meat will eventually tender up but true test is the steak. Two good looking New York strip steaks where seasoned up and grilled to medium rare, and the result was delicious! Tender, melt in the mouth steak with robust flavor, for true grass fed beef, not supplemented at all by grain, this was quite amazing! The ratio on the result for Grayson Farms was an impressive 0.12:0.19, meaning this is a true healing food. Of course I was intrigued to know the secret of how beef van be truly grass fed and yet so tender. 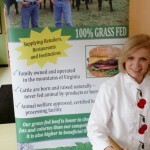 Grayson Farms beef is raised in the mountains of Virginia on four different types of mineral rich grass. Strict sustainable farming practices and protocols are in place to ensure the animal is never given antibiotics or hormones and raised in a natural environment, and only fed silage during the winter made from Grayson Farms grasses. Grayson Natural Farms is available in the Charlotte area at various outlets and to order online http://graysonnatural.com/. 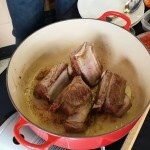 This past weekend I joined Don at the Peachstand to demonstrate this delicious beef, pr eparing the short ribs in a fragrant sauce of coffee, orange juice, red wine and a spice blend from my favorite spice shop Savory Spice in the South End of Charlotte. The particular blend I used ‘Barnet Bay Butcher Rub’ is an interesting blend of garlic, black pepper, Saigon cinnamon, nutmeg and cloves, I added a little cumin and you could use your own blend too. 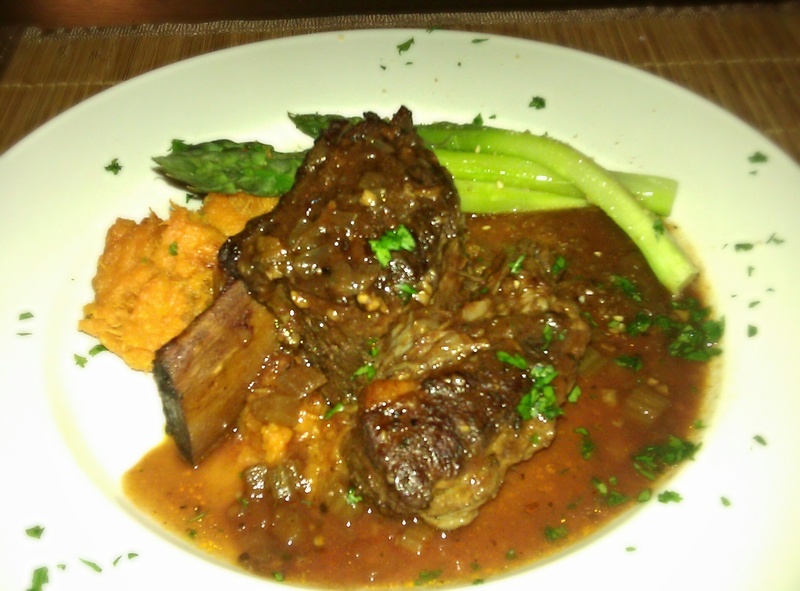 The result was tender beef with deep flavor, perfect comfort food for the cold weather months, the recipe follows below. 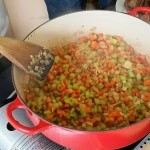 Sauté the vegetables until softened. 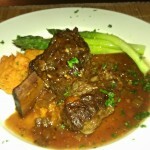 Grass Fed Short Ribs served with Asparagus and mashed Sweet Potato. Coffee, red wine, orange juice with spices; odd sounding flavors complement to create depth of flavors to compliment the rich, grass fed beef. 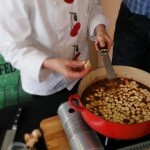 Heat a large dutch oven or casserole over medium high heat, add 2-3 tablespoons Ghee to the casserole and sauté the beef until nicely browned on all sides. Add a little more ghee and slow caramelize the onions. Add the rest of the vegetables, garlic and ginger and cook bout 10 more minutes until softened. Add the seasonings, orange juice, wine, tomatoes and stock to the pan, bring to a simmer. Place the over back in the dutch oven, cover and place in the oven. Regulate heat so that liquid simmers very slowly for 3 to 4 hours. The meat is done when a fork pierces it easily.